Mourners from Nigeria, sing outside the home of former president Nelson Mandela in Johannesburg, South Africa, Monday, Dec. 9, 2013. Along a street lined with walled mansions shaded by graceful jacaranda trees, mourners black and white by the thousands rubbed shoulders Monday outside the villa where Nelson Mandela died, placing flower bouquets and condolence notes on top of piles already knee-high. Others danced while singing praise for the anti-apartheid leader _ a vivid example of the “Rainbow Nation” unity of race-blind multiculturalism championed by Mandela for South Africa. 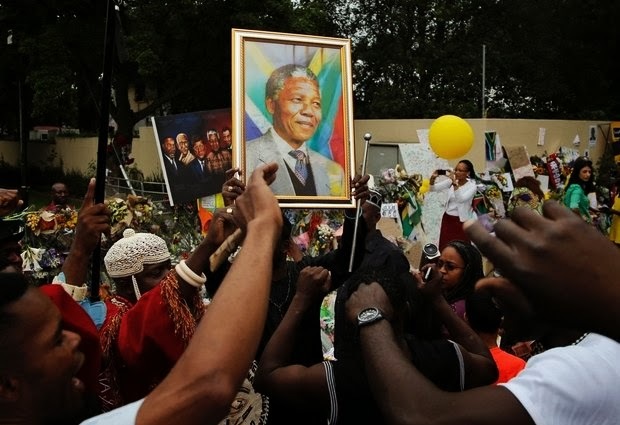 JOHANNESBURG (AP) — Along a street lined with walled mansions shaded by graceful jacaranda trees, mourners, black and white, by the thousands rubbed shoulders Monday outside the villa where Nelson Mandela died, placing flower bouquets and condolence notes on top of piles already knee-high. Others danced while singing praise for the anti-apartheid leader — a vivid example of the "Rainbow Nation" unity of race-blind multiculturalism championed by Mandela for South Africa. As players for the nation's top Kaiser Chiefs soccer team were escorted inside the villa in one of the city's most exclusive neighborhoods to grieve with Mandela's relatives, hospital receptionist Nelson Jabulani Dube said the crowd of black, white and mixed race mourners transforming a street corner into a makeshift shrine was evidence that Mandela succeeded in breaking down barriers in a country defined for generations by race-based hate. "It's all because of him, because he forgave the enemies at that time, they no longer are the enemies," said Dube, 33. "For me the outcome is really stunning and unites us, and what you see here is a reflection of that." Michele Marija, an elderly white Johannesburg resident, spontaneously hugged a black woman, calling her "my sister," after the woman made space for her so she could get a better view of the shrine. Then Marija's daughters also hugged the woman. Marija insisted that her daughters and granddaughters visit Mandela's house, saying his decision to forgive his white oppressors after being released from 27 years in jail saved South Africa from brutal bloodshed. "We could easily have had a revolution and here we are now all living happily together which is something like a miracle and it's all due to Madiba," Marija said, referring to Mandela by his clan name. Diane Mathabatha, a 60-year-old member of Mandela's Xhosa tribe visiting Mandela's house with her grandsons, remembered in the 1990s being bent on revenge along with much of her generation until Mandela got out of prison and said that would be wrong. "He came out and embraced everybody and taught us that, you know, sometimes with your enemy, when you bring him closer, it's much better than fighting him," Mathabatha said. Mncedisi Xego, related to Mathabatha by marriage, came to the shrine with his wife Lesley, who is white, and their children. Their 9-year marriage wouldn't exist without Mandela, he said, adding that their children needed to see the shrine. "It was very important for them to come and say 'thank you' to Mandela because today, they can have the kind of lifestyle that they chose," Xego said. "There are no restrictions in terms of where they can go, which schools they can go to, whom they can be friends with, who they can marry." As mourners danced in a circle singing "Mandiba, you are the holy man" in the Sesotho language, retired white school principal Johann Nel struck up a conversation with 29-year-old medical salesman Ricardo Louw, recounting how he managed to keep his marriage to his black wife Maria secret during apartheid. Nel and his wife Maria married in Swaziland because apartheid prohibited mixed marriages. She went to live in Mozambique, and he drove there weekends to visit. They went on to have two children, but in 1975 worried that he wouldn't be able to visit anymore as Mozambique neared independence from Portugal. So they decided to smuggle her and the children back into South Africa so they could live separately, but secretly visit each other. To make it by South African border police, Maria Nel got out of the car and walked through on her own since she would have been prevented from entering with her husband. He laid down their baby boy on the floor of the passenger seat covered with newspapers and had their 3-year-old son lie on back seat covered with a jacket and clothes. Johann Nel cracked his window to slip paperwork to the border control police stating he was the only person in the car, praying the officer wouldn't demand to look under the newspapers or the clothing. "But it was as if God had blinded that policeman's eyes," he said. The officer waved him through and he reunited down the road with his wife. They lived separately in secret until they could finally be together as a family until more than a decade later. Louw, who is black and has a white girlfriend, listened in awe and then said that Mandela's work and legacy "spared us those kind of frustrations." "She says if it wasn't for this man we wouldn't be together," Louw said. But some South Africans who came to pay their respect outside Mandela's home said the gathering was meaningful but a rare kind of event in the country. Yvette Babb, a 30-year-old white economist who decided with her work companions to do a jog by the house during their lunch break, said the last time she has seen something similar was when the country banded together as one during the 2010 World Cup. "It's something we don't experience often enough."